Heavily scented leaves are used to season fish, shellfish, poultry stuffing, soups, or vegetables. Perennial; to 1 foot tall. Zones 1–24. Lends a sweet-spicy flavor to sauces and pesto. Annual; grows to 2 feet tall. All zones conducive to growing. 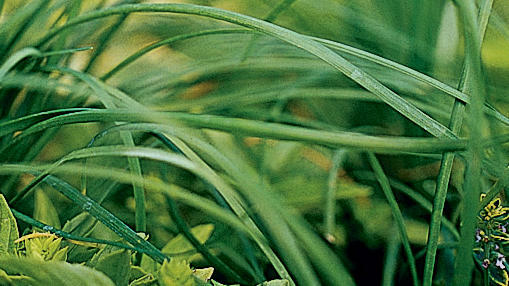 Green, grasslike, 12- to 24-inch-long spears form in clumps. Clusters of rose purple or white flowers in spring. Perennial. Zones 1-24, H1-H2. Fresh cilantro leaves add flavor to salsa and guacamole. Annual; grows to 1½ feet tall. Shade in hottest climates. All zones conducive to growing. Fresh or dried leaves of this perennial add spice to Spanish and Italian dishes such as pizza and ravioli. Plant grows to 2½ feet tall. Zones 1–24. Flat-leafed Italian parsley is more flavorful than the curly-leafed French variety. The plant grows 2 to 3 feet tall. All zones conducive to growing. Musky, earthy leaves are staples in poultry stuffing, Italian meat dishes, and salads in the Middle East. The plant forms a mound 1 to 3 feet tall. Zones 2–24, H1, H2. The aromatic leaves season meats, sauces, and soups. ‘Tuscan Blue’, a favorite of many chefs, grows to 7 feet tall. Zones 4–24, H1, H2. Oval gray green leaves on 1- to 2-foot-tall plants. Milder and more floral than oregano. Perennial in zones 8-24; annual elsewhere. Sprinkle its feathery leaves on grilled fish and in salads and sauces. An annual, dill grows to 4 feet tall. Zones 1–24. Peppermint and spearmint are favorites for flavoring teas, salads, soups, and cool drinks. Spreads fast by underground stems; grow it in pots. Perennial. All zones support growth. Use fresh or dried leaves in salads and cooked dishes. A sprawling perennial, it grows 2 feet tall. Zones A1–A3, 2B–10, 14–24. Its leaves have a parsleylike flavor with overtones of anise flavor; tasty in soups or salads. Zones 1–24. Pronounced “oh-ha sahn-ta,” meaning “sacred leaf.” When chopped, its leaves add zest to mole verde (green sauce) and tamales in Mexican cooking; the plant reaches 6 feet tall. Sunset climate zones 8, 9, 14–24. Its leaves taste something like mint, something like cinnamon; they add zest to salads. Warm-season annual; grows 2 to 3 feet tall. All zones support growth. Often sold as kaffir lime and used in Thai cooking, its leaves add zing to soups, salads, and stir-fries. Tree grows to 16 feet tall; protect from frost and wind. Zones 8, 9, 12–24, H1, H2. Leaves have an aroma of anise or fennel; use them fresh or dried to season black beans, tamales, and enchiladas. Perennial; to 2 feet tall. Zones 8, 9, 14–24; annual elsewhere. Made of small, densely packed leaves and succulent stems (that don’t become woody), this compact basil is the perfect base for a powerful pesto. The red ruffled leaves of red shiso are a perfect foil so all the green in a vegetable patch. Use the intensely herbaceous-flavored leaves in salads or your homemade sushi rolls. Don’t try to stop the blooming on Thai basil—it flowers quickly and can be enjoyed flowers and all. Technically edible but grown more for its ornamental appeal, this creeping thyme has white and green leaves that glow as a bed end. This plant only needs occasional water once established. With dark burgundy and copper-tinged leaves, this basil is highly ornamental. Plant next to green forms for a playful pattern. Use as you would any other basil—perfect for drinks, salads, soups, and pasts. Leaves of this sage smell absolutely of tropical pineapple. Grows 3 to 4 feet tall and wide, and makes a great background for an herb border. Flowers are tubular and red—attractive to hummingbirds and butterflies. Sprinkle flowers or leaves in salads or use in herbal infusions. Large-leaved classic Italian basil. Keep flower stalks pinched for bushier growth. This creeping variety of oregano does best in a touch of shade. It makes for a great understory in an herb garden, surrounded by taller plants. 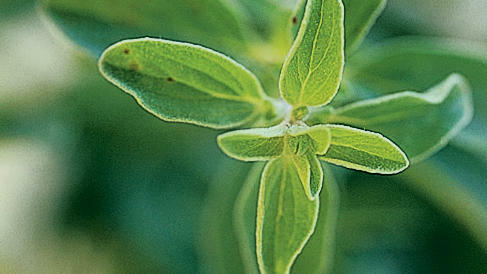 Use the tender, chartreuse leaves just as any other oregano. This basil the most intensely fragrant and gorgeous you’ll find. Smells of wintergreen. Gray-green leaves with irregular cream border; new foliage is flushed with purplish pink. Less flavorful than traditional varieties but makes an extra pretty garnish. This perennial basil is the only type that grows successfully in foggy San Francisco! The bad news: it’s slightly fuzzy textured and musty-flavored. This low-growing, variegated thyme has glowing shite sheen. It handles drought like a pro and still gives off a lovely aroma. Cheery daisies with white petals and yellow centers sit atop feathery chartreuse foliage. Seeds readily. Very pungent—best as garnish. Stunning flowers that are irresistible to hummingbirds, butterflies, and bees. Use the fragrant flowers in salads or infusions. Soil. It should be fast draining; dig compost into garden beds before planting annual herbs. For herbs in containers, use potting soil. Water. Give newly planted perennial herbs regular watering (once established, most tolerate some drought). Annual herbs such as basil need regular water throughout the growing season. Mint prefers slightly moist soil. Fertilizer. Most herbs appreciate occasional supplemental feedings during the growing season; use an organic granular fertilizer. For ‘Kieffer’ lime, use a plant food formulated for citrus. Harvest. For most: Snip fresh new growth as needed. For lemongrass: Cut off the thick, bulbous stems just above the crown (ground level); peel off outer sheath and use the bottom third of the stem in cooking. Because you can make only so much pesto, here are 5 new ways to use fresh-picked herbs. Cocktail. For a zingy cocktail, mash mint leaves with minced ginger, lime juice, and ice. Add light rum, shake well, then strain into a cooler glass and top with ginger beer. Soup. Add ‘Kieffer’ lime leaf and lemon basil to chicken and rice soup. Sprinkle with sliced chiles and fresh cilantro leaves for a Thai version of the classic. Sandwich. Mix chervil, dill, and tarragon into mayonnaise with minced red onion and celery. Stir mixture into chopped roasted chicken and serve on toasted croissants. Side. Fold chopped sage and blue cheese into mashed potatoes. Sprinkle with chopped toasted hazelnuts. Main. Top a piece of snapper or black cod with salsa verde, cilantro, and epazote leaves. Wrap the seasoned fish in an hoja santa leaf and rub the outside with oil. Grill until fish feels firm. Serve with rice and beans. Mountain Valley Growers. An excellent site for organic seedlings, including 17 varieties of mint. Kitazawa Seed Company. This company based in Oakland, California, specializes in Asian herbs and vegetable seeds, including five varie­ties of shiso. Baker Creek Heirloom Seed Company. This source has earned a dedicated cult following for its more than 1,400 unusual seeds. Companion Plants. Sells seeds and plants of unusual herbs, including hoja santa.